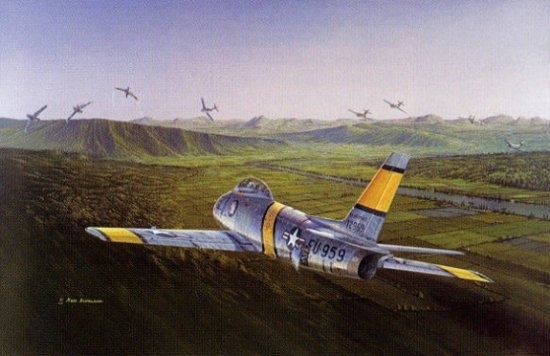 Overall Print Size: 25" x 19"
With talk of an armistice only weeks away, F-86 pilot Ralph Parr was afraid the Korean War would be over before he would get into air combat. Flying a routine patrol over the Yalu, Parr spotted a glint of light low against the ground and suspected enemy aircraft. Rolling into a Split-S, Parr dove his F-86F down from 41,000 feet and closed rapidly on the suspicious image. Soon he saw four MiG-15's right in front of him, but a quick look left and right revealed that there was really a total of 16 enemy aircraft. Not one to miss an opportunity, Parr engaged the closest aircraft and was immediately in a boiling dogfight right on the deck. After destroying two MiGs and damaging another, the remaining aircraft fled for the North. Ralph Parr finished the Korean War a double ace, shooting down ten enemy aircraft in just 30 missions over the course of five weeks.